Blend first four ingredients together in a blender. Transfer to a bowl and freeze for 2 to 3 hours until solid. Break into chunks and blend again until creamy. Return to the bowl and freeze again for 30 min. Make individual servings and garnish with a sprig of mint and a slice of orange. 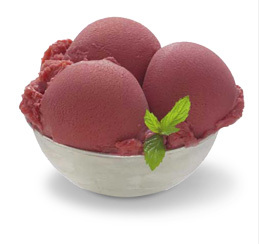 This is a low calorie and healthy substitute for store bought ice cream or sorbet. Use whatever fruits you enjoy for a creative guilt free treat all summer long.